Not only spaces from left and right but more than one spaces within the words the in string will also be removed by the TRIM function. In this tutorial, I will show you examples of trim for removing spaces from both sides, within text of the text string along with only removing spaces from the left of the text. You may refer the cell or use text as constant literal. You can see the difference how TRIM function deleted the spaces from left and right of the given text. Did you know: The TRIM function only removes spaces with ASCII character (32). If space is due to another character like Unicode non-breaking space character which decimal value is 160, TRIM will not remove this. You can see, after using the TRIM function, the spaces from left and right sides are removed and extra spaces are removed from the words. In certain situations, you may only require removing the leading spaces (the spaces towards left side). 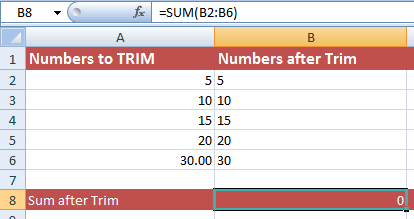 The Excel has no direct function like LTRIM or RTRIM to remove spaces from left or right only, respectively. However, you may use different formula combinations to achieve that. In the following example, the TRIM function is used with LEFT, FIND and REPLACE functions to remove leading spaces. The columns that contain numbers may also contain unwanted space. You may use the TRIM function for removing spaces for number column just like the text. However, be careful, as simply using TRIM makes number as text. You may notice the numbers aligned left after using TRIM whereas the default behavior is aligning numbers right. You can see numbers are displayed left aligned while SUM of B2 to B6 is 0. You can see, the A column contains raw numbers (without any formula with spaces). The B column displayed number after using TRIM function only. The sum is displayed as 0. It goes from C2 to C6 and we got the sum that is correct along with alignment. As mentioned earlier, the TRIM function is designed to remove spaces for ASCII character (32). If you try removing spaces with non-ASCII spaces then it will not. This generally happens due to non-breaking space i.e. CHAR(160) that results if you copy text from the webpages. How to sort this issue for removing spaces? You can see the spaces are removed from the same web page text. What is C# Trim method? How to remove whitespaces in strings of Python?